An interactive, Scripture-based workbook that shows readers how to fight sin effectively and live a more problem-free life. 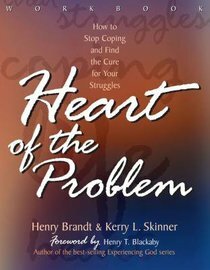 About "Heart of the Problem (Workbook)"
Dr. Henry Brandt is one of the most well-known and respected Biblical counselors today. He has had long career of 40 years during which he has traveled around the world and has written many books offering solutions for Biblical problems. SPANISH BIO: Dr. Henry Brandt es unos de los consejeros Biblicos mas conocidos y respetados de hoy. A lo largo de su carrera de mas de 40 anos ha viajado alrededor del mundo y escrito muchos libros ofreciendo soluciones Biblicas. Kenny Skinner is Associate, Prayer and Spiritual Awakening at the North American Mission Board of the Southern Baptist Convention.